MK Guth is a multidisciplinary artist who resides in Portland, Oregon. She works in video, photography, sculpture and performative exchange based projects. Her work arrives from an indeterminate state of suspicion, where realities fluctuate and believing what one sees is a confining place. 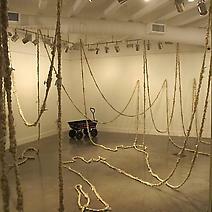 Reviewer Barbara Pollock described Guth’s video I Want To Hold Your Hand as brilliant in February 2003 ART NEWS. Her work has been discussed in other periodicals including Flash Art, New Art Examiner and Art in America. She has received a Betty Bowen Special Recognition Award administered through Seattle Art Museum and an Award of Merit from the Bellevue Art Museum. Guth received a project commission from the Portland Institute for the Arts (PICA) in March of 2000 and a project commission from the Melbourne International Arts Festival in 2005. She has exhibited with numerous galleries and institutions, including The Whitney Museum of American Art, NYC; Boise Art Museum; The Melbourne International Arts Festival, Australia; Nottdance Festival, England; Swiss Institute, NYC; Elizabeth Leach Gallery, Portland; Betty Moody, Houston, TX; White Columns, NYC; Artists Space, NYC; Yerba Buena, in San Francisco; and the Henry Art Museum, Seattle. Guth’s video has screened both nationally and internationally.